Dass der Kampf gegen Filesharing-Plattformen nur reine Symptombekämpfung ist, darauf weisen immer mehr Faktoren hin. Da sind zum einen immer mehr Studien (siehe Linkliste am Ende dieses Beitrags), die belegen, dass Filesharer nicht „der Feind“, sondern die besten Kunden der Medienindustrie sind. Und dann gibt es negative persönliche Erlebnisse von ausgebeuteten Künstlern ;-), ehemaligen Angestellten („Going to sue customers for file sharing is like trying to sell soap by throwing dirt on your customers.“) und zahlenden Kunden. Zu den letzteren zähle ich mich selber. As advised in the forum thread linked below, I send you a list of all possible email addresses that I may have used to register my copy of the game. Please review the images before you send them to be sure they are clear and legible, especially the serial number. Images that are not clear will not be accepted. Mit anderen Worten sagt er damit durch die Blume: Wir glauben nicht, dass Du das Spiel legal gekauft hast. Wobei wir auch den Gebraucht-Handel als unredlich ansehen. Beweis Du uns erst mal, dass Du das Spiel wirklich besitzt! All right. Took me some time to find the invoice. 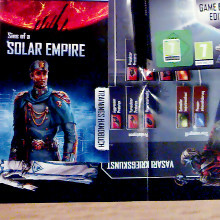 Attached you will find photos of my „Sins of a Solar Empire – Game of the Year Edition“ box, DVD case, poster, the game disc, the soundtrack disc, the manual with the serial number on the back. Also an extra shot of the manual so you can clearly read the serial number „*****-*****-*****-*****-*****-*****“. Then a shot of the manual together with my receipt from World of Games, the shop that sold me my copy at March 24th, 2010 and an extra shot of the invoice, so its clearly legible to you. We are not thieves, we are your best customers! Read the invoice closely: You find two other games that I have bought at the same time. Both special editions. I like PC games, very much. I love ‚em! I spend hundreds of Swiss Francs every year on them. I chose the more expensive editions, cause they come with nice extras which I can hang on my walls and display in my shelves. Some games I buy twice or even more times, because I am a fan and I collect every single edition of them. I liked your „Solar Empire“ very much. I hope the attached photos are prove enough of that. 4) The attachment was a BMP file. To conserve size, please convert it to a JPG or GIF. Please restructure your email and resend it so that we may assist you. I have added a new key to your simon.rupf@domain.ch Impulse account. Please open the Impulse software and follow the instructions below. If you have any further questions or concerns, please let us know. Es hat geklappt und ich sag artig: Vielen Dank, lieber Stardock Support! Dieser Eintrag wurde veröffentlicht in Urheberrecht und verschlagwortet mit Games, Generalverdacht, Medienindustrie, Urheberrecht von Simon Rupf. Permanenter Link zum Eintrag.